rec. 15-16 November 2016 and 9-11 May 2017, St Mary’s Cathedral, Edinburgh. DDD. We are constantly told that recorded music, especially classical music, is in crisis. Releases such as this prove that to be untrue. Look at the summer releases of fifty years ago and you will find slim pickings, with especially few recordings of little-known composers. Had you asked me to name a Tudor called Mundy then, I could only have given you Anthony Munday, the playwright. That would have been the case until The Tallis Scholars gave us a taste of Mundy’s music with their recording of Vox patris cælestis (see below). The Choir of St Mary’s, Edinburgh, have been as instrumental as any in recent years in presenting the music of this period. 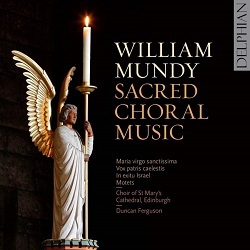 I had intended to make an earlier recording of the music of Mundy’s older contemporary John Taverner from this choir a Recording of the Month, but John Quinn beat me to the draw on that occasion (DCD34023 – review – review). In some ways this new recording is even more welcome: though Mundy’s music appears on several very fine albums, this is one of only two devoted entirely to it and it includes two first recordings. The other, from The Sixteen and Harry Christophers, is on Hyperion Helios CDH55086 at mid-price or, better still, as part of a Bargain of the Month budget-price box set The Golden Age of English Polyphony (CDS44401/10, 10 CDs or download from hyperion-records.co.uk or £29.50). See also review by Ralph Moore. Delphian have recorded Mundy’s settings of the Lamentations on an album devoted to settings of that text (DCD34068, St George’s Choir, Windsor, with music by Tallis, Ferraboso, Byrd and Parsley). The good news is that the new CD duplicates very little of the music on the Hyperion recording, which remains essential for including some of Mundy’s post-reformation music set to English texts; the new release concentrates on the Latin works composed during the brief return to Rome in the reign of Queen Mary. Ever since the Tallis Scholars surprised us by including Mundy’s Vox patris cælestis on a recording first released on Classics for Pleasure, it’s become almost de rigeur to include that piece. That recording remains available on the Scholars’ own Gimell label at budget price, an almost mandatory purchase for anyone with the slightest interest in polyphonic music (GIMSE401, with Allegri Miserere and Palestrina Missa Papæ Marcelli – review). Other very fine recordings of the work include The Sixteen’s The Voice of the Turtle Dove (COR16119, with Adolescentulus sum ego and music by Sheppard and Davy), The Tudors at Prayer (Linn CKD447, Magnificat/Philip Cave, with Adhæsit pavimento, Adolescentulus sum ego and music by White, Tallis, Taverner and Byrd – review – review) and Westminster Abbey choir’s Mary and Elizabeth at Westminster Abbey (Hyperion CDA67704, with music by Tye, Sheppard, Tallis, Byrd and White – review – review). Duncan Ferguson takes his choir at a fairly fast pace here, a shade faster even than The Sixteen. The extremes are 21:34 from Magnificat (Linn) and 17:21 here on Delphian, with the Tallis Scholars taking 19:16. Before I started making comparisons, the pace on the new recording seemed so right that I wondered if I had been wrong to like the other recordings – DL News 2014/2 (Sixteen) DL News 2014/7 (Magnificat). Though the more expansive Linn works well, as does the Tallis Scholars’ approach, the fast pace on Delphian in no way diminishes the power of the music. Indeed, the Edinburgh team may well seem preferable even to the Scholars for many listeners; the latter seem a little subdued by comparison. The Edinburgh and Westminster cathedral choirs on Delphian and Hyperion also probably sound closer to what Mundy would have expected, albeit with the addition of girls’ voices in Edinburgh. What they lose by comparison with the professional groups, they make up for in many other ways. Three of the works on the new Delphian album are making their recorded debut. Maria virgo sanctissima (track 2) is performed with the missing tenor part restored. This turns out to be a minor masterpiece, but the other two new works are also well worth hearing. The paucity of recordings devoted solely to Mundy in no way reflects the value which his contemporaries placed on his music: the pre-reformation Baldwin and post-reformation Chirk partbooks (Baldwin: Signum SIGCD408 – review – Chirk: Hyperion CDA67695 – review) preserve some of his works. The Easter processional In exitu Israel, which closes the programme, is a collaborative piece, Mundy working with two of his better-known contemporaries, the older John Sheppard and the younger William Byrd. The whole programme serves to demonstrate that Mundy is certainly worthy to be mentioned in context with them – and even with Tallis, for that matter. The publicity material mentions the choir's evident delight in performing the music; that's matched by the delight of hearing it. The recording is very good, and the project is crowned by an informative set of notes – helpful for scholarly readers and approachable for the rest of us. Another very fine offering from Delphian and the Edinburgh Cathedral team.